For many people who are looking at undergoing orthodontic treatment, one of the most worrisome considerations is how treatment will impact day-to-day life. While treatment does have an effect on daily life, most people find they don’t have to make as many changes as they expect at the outset, and that, once they're used to their orthodontic appliances, they really spend only a small portion of their days thinking about them. Whether you’re wearing braces or Invisalign aligners, your oral hygiene routine will inevitably need to change. That is, it’s going to become more involved! If you wear braces, you’ll need to spend more time carefully brushing and flossing your teeth, to make sure you clean out all the nooks and crannies created by your orthodontic gear. If you’re using Invisalign, you’ll be able to take your aligners out to eat, brush and floss, which will make these tasks easier than if you were wearing braces. But you’ll also still need to take the time to clean your aligners each time before you put them back in, and to brush and floss your teeth after each meal as well. You’ll have to spend some time getting used to your new orthodontic appliances, meaning that social activities like talking, laughing, eating and even kissing will each be a new learning experience, and not a little awkward. These issues will sort themselves out fairly quickly, though, as you become accustomed to your braces. 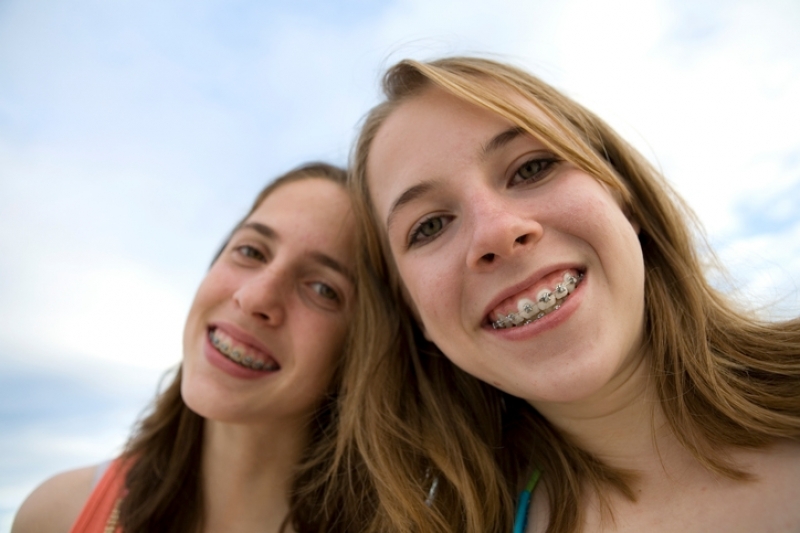 Kids, teens and adults alike may sometimes find that immature people will tease them about their orthodontic treatment. This is obviously silly, but it may take some practice to not let it get to you. That’s normal, but just remind yourself; you’re undergoing a medical treatment, and in the end your oral health and your smile will be greatly improved! In addition, you may also find it takes some time for you to get used to how different your smile looks with braces on it. It can help to practice smiling in front of the mirror, or even taking some selfies from different angles, to get used to your new look. Eating and drinking habits will also change to some degree when you’re undergoing orthodontic treatment. First of all, as mentioned above, you’ll have to take extra care of your oral health routine, and include a brushing session after each meal. This is not only to preserve your oral health; it’s for the sake of your dignity, too! The fact is, food debris gets stuck in braces far more easily than in teeth, meaning that if you're not vigilant about oral hygiene, you may wind up going through your day with a bit of spinach dangling from your braces. It’s not a good look, so brush and floss often! Finally, you’ll also need to make some changes to your diet, since certain foods do not mix well with braces. Hard and crunchy foods, foods that you have to bite into, or sticky and gooey foods are all off limits! This is because all of these types of foods can cause damage to your braces, potentially derailing the progress of your treatment. This may all seem a bit overwhelming, but not to worry! Once you get used to it, you won’t spend much time at all thinking about your orthodontic treatment throughout the day. If you have more questions about what to expect from orthodontic treatment, contact Langley Orthodontics to book an initial, no-obligation consultation to discuss your needs and treatment options.